of you were here for that conference, you may remember that on the center tables at one of the big, giant, full group meetings upstairs, there was a little questionnaire about adapted PE. school district around students with disabilities and adapted physical education. We also sent a similar electronic questionnaire out to IU directors, trying to get information from IUs as well. your related service providers. So for instance, a physical therapist may be working with a student on some very specific goals that lend itself beautifully to the adapted phys ed program. Becky. 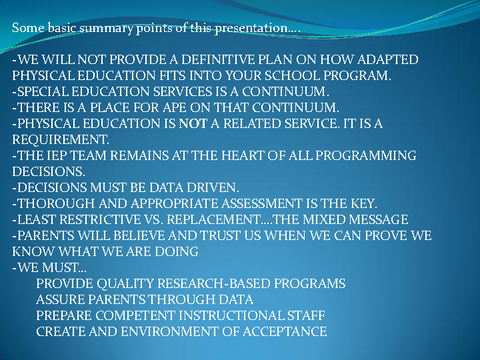 If you paid attention to the first eight slides, you really have the essence of what we need to talk about today. So I'm not telling you to leave, but that's really the meat of it. that continuum and to make sure that every option is considered. I feel physical education has a little bit of an advantage, and I'll talk about this more later, because it's more apparent. situation. A student in -- with students with autism, there are students with autism in this classroom. Can you find them? Can you find any of the students with IEPs from looking at that? seen how these people from like the Council for Adapted Physical Education really flew with this, and the strides they're making and the methods they're using to identify and program. a scientist or a novelist, the things that may have happened. Maybe there wouldn't be Special Olympics. You know, it might be the National Special Science Fair. I mean, any of these things. world of individual education. Okay. You know, there's separate classes, which are good. There's included same physical education. You know, this looks like my class that I used to teach. lawyers? And this is where it's coming from my personal experience. You know, because we are getting a mixed message, all right? You know, at Lebanon, we went through our LRE improvement. the big decision, including adapted physical education. How do we determine what level and type of instruction children will receive? Okay. And you know this. We're not a standalone anymore. must be involved. And that's something that you have to push for. I know time is really tough, but even if it's just a five-minute drop in, you know, by the regular education teacher. the subject of some bullying. Well, thank you, Dr. Tate. Mother and I are concerned as well. We see these things are happening and we appreciate the school working with us. Well, Mr.
it's important to get to the source of the problem before we can deal with it. And sometimes that puts us out of our comfort zone a little bit. And I've come to some conclusions about this. superintendent is going to hear from the lawyer too. I'm pulling my kid out of this school and I'll tell you what, I see you out of this school, you're going to find out what ugly is. it's not home economics. What is it now? REBECCA FOGLE: Family consumer science. FRANK REPANSHEK: Family consumer science. But, well, but they closed the home economics classes, you know? would not let a child fail. He would not differentiate their instruction. He would not teach it separately. But Carl won't fail. I'll just adjust his grade at the end of the marking period. there are PE teachers in the audience that are familiar with that, that you can go in. There's like lesson plans available. There's suggestions, adapted equipment examples, things like that. right now? And what makes this a skill deficit that we need to work on? Just like if it were reading -- AUDIENCE MEMBER: Compare it to the standards. REBECCA FOGLE: Excellent suggestion. particular question. PRESENTER: So Frank and Becky, thank you very much. REBECCA FOGLE: Thank you all. Thank you for being here.